The Continental Cross Country UHP * is part of the 4x4 family from Continental. 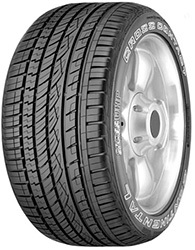 The tyre is better used as a road tyre and with the asymmetric tread pattern will give better handling on corners.The tread pattern also helps to maintian grip in the wet so rest assured you will get a brilliant feel from this tyre regardless off wet or dry weather.The Cross Country UHP also comes as a run flat if desired.The tyre is also the original tyre on many 4x4's on the market today.The manufacturers that use the Cross Country UHP are; Volvo XC90, Mercedes M-Class and BMW X5. The Cross Contact UHP * tyre has been designed for Porsche 4x4s.